The Atlantic Forest is considered the second most threatened ecosystem in the world today. Originally, it covered an area of over 1.3 million km2, spread across 17 Brazilian states, and occupied nearly 15% of the national territory, including the Serra da Mantiqueira. Today, the remaining area corresponds to less than 8% of the original. The “Atlas of the Evolution of the Remaining Forests and Ecosystems of the Atlantic Forest, 1990-1995” points out a deforestation rate of 500,000 hectares in that period. The Atlantic Forest has a large degree of, as well as the largest diversity of tree species per hectare in the world. It is also the natural habitat for 10.000 plant species (almost half being exclusives to Brazil), 131 species of mammals (50 of them endemic), 620 bird species and 260 species of amphibians. 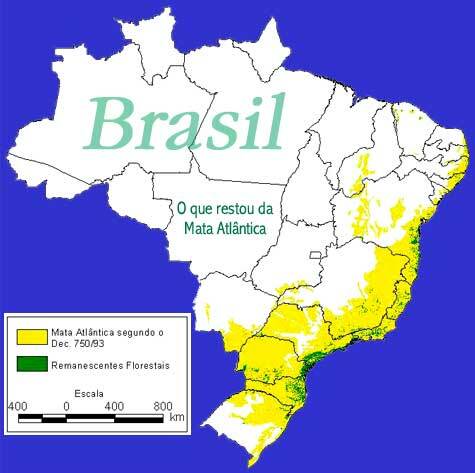 The vast majority of the Brazilian species of plants and animals threatened with extinction in Brazil are represented in this biome(and) Of the seven Brazilian species considered extincted in the last few years, all of them were distributed in the Mata Atlântica. Moreover, the water sources within the Mata Atlântica are the guarantee of drinkable water for more than 100 million people, or 60% of the Brazilian population.